Ireland and the Balkans have come to represent divided and (re)united communities. They both provide effective microcosms of national, ethnic, political, military, religious, ideological and cultural conflicts in their respective regions and, as a result, they demonstrate real and imaginary divisions. 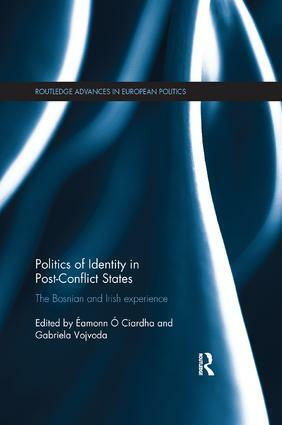 This book will specifically focus on the history, politics and literature of Bosnia-Herzegovina and Northern Ireland, while making comparative reference to some of Europe’s other disputed and divided regions. Using case-studies such as Kosovo and Serbia; Lithuania, Germany, Poland, Russia and Belarus; Greece and Macedonia, it examines ‘space’, ‘place’ and ‘border’ discourse, the topography of war and violence, post-war settlement and reconciliation, and the location and negotiation of national, ethnic, religious, political and cultural identities. The book will be of particular interest to scholars and students of cultural studies, history, politics, Irish studies, Slavonic studies, area studies and literary studies. Éamonn Ó Ciardha is Senior Lecturer in the School of Irish Language and Literature at the Ulster University. Gabriela Vojvoda is a Research Assistant at the Visiting Professorship Europaicum and Lecturer at the University of the Saarland.